Music aficionados in Perak were in for a rare treat when world-renowned ‘flute and guitar’ duo, Aisling Agnew and Matthew McAllister performed at Taman Budaya recently. The concert, organised by Perak Society of Performing Arts (PSPA) in collaboration with Classical Music Society of Selangor and Kuala Lumpur (CMS), was the first of its kind in Ipoh. 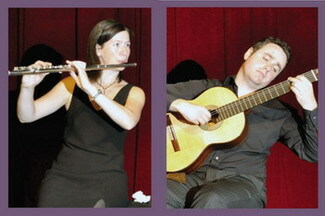 “The concert was phenomenal as they are the best flute and guitar duo. We also encouraged music lovers to join the workshops as this was an once-in-a-lifetime opportunity to learn from the very best,” explained Datin Rosalina Ooi, President of PSPA. Classical guitarist Matthew McAllister who comes from Scotland and flautist Aisling Agnew, from Ireland, are recognised as premier exponents of the new music genre. Their critically acclaimed album Recital features a wide range of virtuosic and beautiful music from around the globe. The duo’s premiere recording of Greg Caffrey’s Pluck, Blow ll (The Return) was recently featured on RTE Lyric FM’s latest CD release Hiccup. Aisling and Matthew have taken their music around the world, giving many high profile concerts in the United Kingdom, North America, Peru and Costa Rica. In conjunction with the concert, the duo also conducted workshops at the PSPA office.